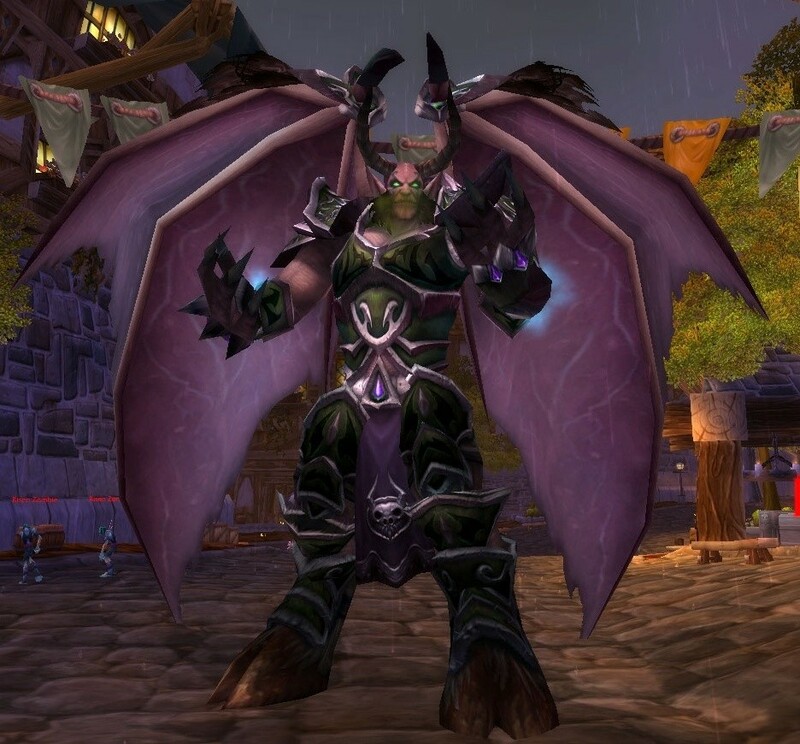 Mal'Ganis, the final boss of the Culling of Stratholme instance. So, before we begin, I’d like to just quickly go over my gear. You’ll notice, that there’s a disturbingly large number of blues there. But rest assured, phase one of my plan to get rid of them. Now, while I am going with the theory that this guide is for completely fresh 80s, no this isn’t quest gear. I’ve run a few heroics, and half of Naxx 10 once to get this. Trust me though, I’ve put barely any work into my PvE gear, and the epics I do have would have been considered passable in patch 3.0, but not anymore. So, in the head slot I’m currently packing: Gaze of the Somber Keeper. This is a leather head piece that drops from ToC normal 5 man. Back in 3.2 when I got this gear, ToC was mostly the way to go for gearing up. But the point here is that it was a major upgrade from the blues I had. It’s got okay stats, but nothing really great. Neck = Evoker’s Charm. This is probably my best piece of gear in terms of item level. I bought it for Emblems of Conquest (more on that later) which I saved up while I got my other gear. It has some solid stats and a thrilling item level (again, more on that later) of 226. This will be one of the last things I replace since it’s already a tier above my other gear. Shoulders = Purehorn Spaulders. A blue leatherworking piece of gear. I believe it requires a leatherworking of 420 to make, but I got mine off the AH. This is pretty bad gear, and I only have it for lack of better caster shoulders. It’s at the top of my replace list, along with the other blues. Back = Cloak of the Gushing Wound. A cape that drops in Heroic Violet Hold. Don’t even get me started. This is a piece of feral gear that I actually used in PvP when I first dinged 80 (remember I PvP feral). It’s not caster gear at all, and it’s only there because I don’t have a caster cape. Obviously, it needs to go. Chest = Tunic of the Unduly Victorious. Another blue piece of caster gear that actually is quest gear, picked up somewhere along the line in the Icecrown quests while I was leveling. Wrists = Plague-Infected Bracers. These drop off the last boss in Heroic Culling of Stratholme. They’re not bad, but again, only very entry level epic. My weapon is the Jailer’s Baton. Another piece of feral gear that I need to replace. My Idol is Harold’s Rejuvenating Broach, which I picked up while healing some instances while I was leveling (in Outland, I think). It’s totally useless for dps, so it needs to go too. Gloves are Awakened Handguards, which are caster gear at least, but still not very good. And from there I’ve got Binding of the Tranquil Glade, Leggings of the Winged Serpent, and Boots of the Follower, which are all entry level epics. The belt and the legs came from ToC and the boots are from Naxx 10, but they’re all item level 200 gear. I’ve also got some rings and trinkets I picked up from Brewfest and Hallow’s End, which I’m not going to go into, since they’re both long gone for another year, and since Cataclysm will likely be out by the next time they roll around, you’ll probably not have a chance to pick them up. Use whatever trinkets and rings you’ve got for now and replace them with better gear when you get a chance. So why am I giving a list of all my gear? The point is that my gear is pretty awful, but I’m still going to make it work, until I can improve it. Now if you’re an honest to God fresh 80, and are in quest greens and blues, that’s fine too. The entry level heroic dungeons are meant to be doable for brand-new 80s. I ran a handful of heroic dungeons, half of Naxxramas 10 man normal (the lowest level raid in this expansion) and spent a couple hundred gold on the AH to get the gear I’ve got now. But you don’t have to spend anything, just hop right into some heroics and get to work. The gear will come. So, now that I’ve established just how little good gear I have, the next step is… getting good gear! So on with the show!